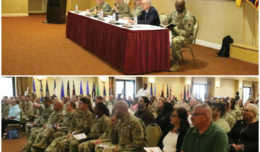 Ethan Larimer, 11th Armored Cavalry Regiment Honorary Blackhorse Trooper, and Col. Joseph Clark, commander, 11th ACR, share humorous stories at the regimental headquarters, Fort Irwin, Calif., on May 31, 2018. Ethan enjoys discussing tanks and other aspects of the military with the regimental commander. 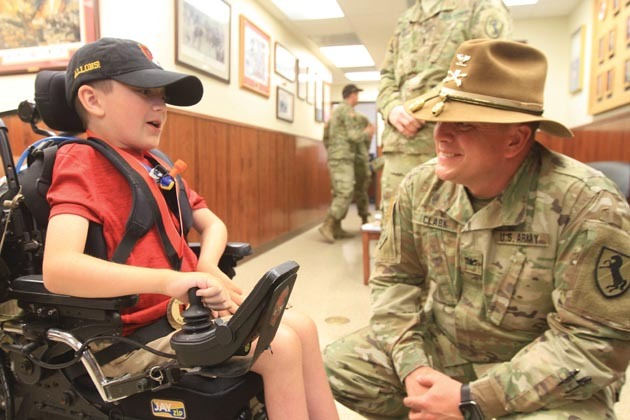 FORT IRWIN, Calif. —The 11th Armored Calvary Regiment recently granted the wish of Ethan Larimer, a boy with a rare disease who wants to follow in his father’s footsteps and become a Blackhorse Trooper. 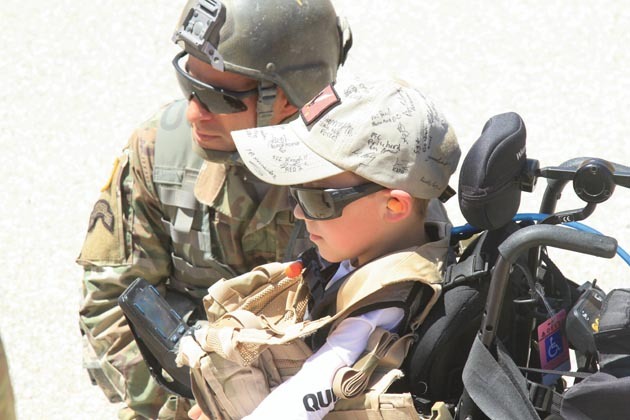 With the help of the 1916th Support Brigade, the 11th ACR and Carla Averill, a family friend, Ethan’s dream was made into reality at Fort Irwin on May 31, 2018. Ethan’s mother, Victoria Perkins, contacted Averill with the request of fulfilling Ethan’s dream. Immediately after, Averill contacted the 11th ACR Command Team and 1916th Command Team to make Ethan’s dream come true. Ethan has a medical condition called Charcot-Marie-Tooth neuropathy type 4J (CMT4J). This disease has made him wheelchair bound and delayed his ability to develop crucial motor skills. Though Ethan will never be able to serve in the Army due to his disability, he still dreams of riding into battle on the back of tanks. The famed Blackhorse Regiment was happy to oblige. Upon arrival to the Regimental Headquarters, Ethan was inducted into the Blackhorse Honorary Rolls, an honor set aside for those who have served the Blackhorse regiment above reproach. 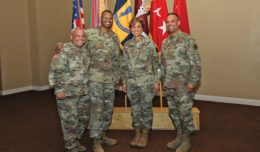 The regimental commander then presented the Regimental Command Team coins. Ethan had a wish list for his visit, said Averill. He wanted to see a gun, drive his wheel chair into a tank, and see a helicopter. The 1916th supplied a UH-72 Lakota and 11th ACR supplied a Main Battle Tank, OPFOR Surrogate Vehicle. The regiment also demonstrated the use of a M240B Machine Gun, Browning M2 .50 Cal. Machine Gun, M249 Squad Automatic Weapon and M4A1 Carbine. After completing Ethan’s wish list, the Blackhorse Regiment pulled all the stops to ensure his experience he would never forget, said Averill. Ethan was given a personal “Box Tour”, an event where people are shown the ins and outs of training and battles at the NTC. Later, Ethan was shown a demonstration of a battle in Razish, a constructed town in the NTC’s training area. He then led a platoon during building clearance drills through the streets of Razish. After leaving the Box, the 11th ACR’s Horse Detachment gave Ethan a tour of their stables and brought some of the horses out to greet the young Trooper. 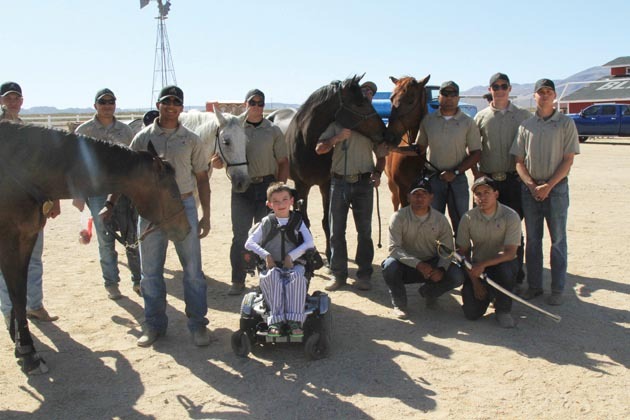 The Horse Detachment conducted a special demonstration for Ethan and his family to mark the end of Ethan’s day in the life of a Blackhorse Trooper. Ethan Larimer, 11th Armored Cavalry Regiment Honorary Blackhorse Trooper, oversee Blackhorse Troopers running building clearance at the National Training Center, Calif., on June 1, 2018. Ethan was trained on building clearance operations by Sgt. 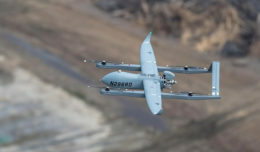 Maj. Mason Joiner, operations Sgt. Maj. 2nd Squadron 11th ACR. The 11th Armored Cavalry Regiment Horse Detachment Troopers pose with Ethan Larimer, 11th ACR Honorary Blackhorse Trooper, at Fort Irwin, Calif., on June 1, 2018. The Horse Detachment competes across the United States in various military equine events.